As most stories start out, "Once upon a time", this is about a Buffalo hunt in Zimbabwe. We got a little too close to the Buffalo, or maybe I should say, they got a little too close to us! We were stalking a herd of about 20 animals, and got settled behind a big aunt hill and waited to see what was going to happen. There was one good bull in there, and we wanted to get a shot if possible. The wind was perfect, and we just sat behind the hill, and peeked around the corner to watch. Naturally the bull we wanted was on the far side of the herd, and darned if the cows closest to us just kept working their way towards us. Little by little, over a half and hour period of time, they ended up right on the other side of the ant hill we were hiding behind. The PH just motioned, not to move or even breathe. We now had 6 cows no more than 4-5 yards from us. They surely did not know we were there and at this point, we did not want them to find out either! The PH picked up a little stone, and winked at me and motioned to watch him. He took the stone and snapped it off his thumb like you would as if you were shooting marbles hitting the rear cow in the hind leg. She just looked around, and could not figure out what that was. around to face the first cow he hit. She now butts head first into her as if to make a point of the fact she was not to be touched by anyone. He now takes another pebble, and hits a third cow, as they are still only 3-4 yards away. The third one now spins around and gives the first two a "dirty" look. The three cows are now trying to figure out who is poking whom with what. The rest of the herd is now totally intent on watching what is going on. At this point we are not sure what to do because if they do get our wind, odds are they will not run, but charge as we are way too close for their comfort zone. At this point a ground squirrel comes along, and runs under one of the cows and spooks her. At that they all took off running, and thank goodness, they all went the other way. 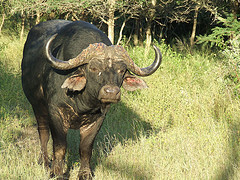 We never did see the Bull again until about two hours later along the river on a sand bar. I never knew a Buffalo had such a great sense of smell, but as the herd came along and when they crossed our tracks in the sand, they bolted like a shot had been fired. Just the scent of our boots in the sand spooked them. Problem was I was set up behind a log like shooting off a bench rest, just waiting for them to come into view. Naturally the Bull was the third one back, and when the front cow bolted, so did he, and that botched up our chance for a shot. So ended a quite interesting day of up close and personal hunting. Nice post and great story. Not enough detail. No kill shot. I READ YOUR GEMSBOK STORY TOO. APPARENTLY YOU LIKE TO GET CLOSE TO DANGEROUS WILD ANIMALS. I BET YOUR HEART WAS PUMPING LIKE A STEAM ENGINE! !